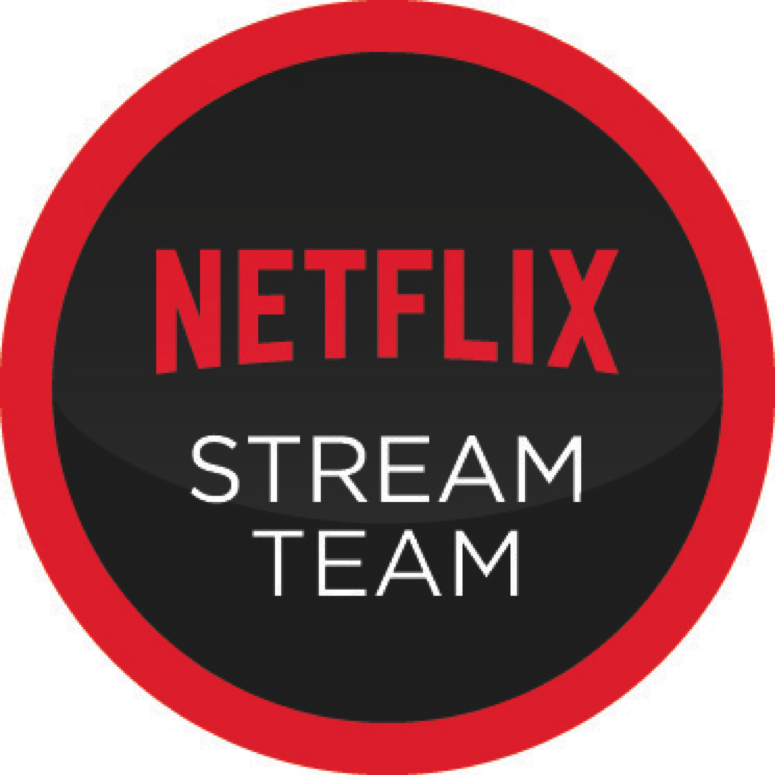 When I was invited to join the Netflix #StreamTeam, I jumped at the opportunity! My husband, Grant, and I have been streaming shows and movies from Netflix for years! We discovered so many new TV series. Several Netflix original series, such as Orange is the New Black and House of Cards, quickly became our favorites! To be honest, I could easily get rid of cable and just subscribe to Netflix. My husband, however, needs his live sports. Watching shows on Netflix is less time consuming (no commercials), and we can easily binge watch more episodes if we get sucked in (which we often do)! We stream shows from Netflix more often than we watch cable TV! I am so excited for the opportunity to partner with Netflix over the following year! So many mini milestones come up in life, especially in a family. From the simple moments to the exciting moments, Netflix has it covered! Parenting four children can be exhausting. By the end of the evening, Grant and I are more than ready to kick back on the couch, grab some snacks, and watch some of our favorite shows. Watching Netflix together is part of our nightly routine. It may seem so simple and ordinary, but we bond so much over our favorite shows. Sometimes, we just need to give each other a high five and breathe a sigh of relief, because we made it through the day! From old favorites, such as Frasier and Cheers, to new favorites, such as Dexter and The Walking Dead, we've watched a wide variety! One of the shows we discovered while I was pregnant with our fourth child was Parenthood. This endearing show sucked us in from the first episode. The Bravermans are a very likable family and the storyline was very real. I felt like I could relate to the characters, and I laughed and cried along with them. I often found myself rubbing my belly and wondering if our baby would be a boy, making our family just like the Bravermans. Sure enough, baby #4 was a boy. However, we were able to relate to the show even more, because our son had special needs, like Max Braverman. Some of the episodes had such an impact on me, that I have to go back and re-watch them every now and then. There aren't many shows that make me want to do that, but Parenthood is one of them! Netflix is not just for adults. My kids love Netflix, too! There is a wide variety of shows for them to watch, so they never grow bored with it. They love watching their favorites over and over again! Halloween is coming up, and I really wanted Lily to be prepared for Trick or Treating this year. Although she has gone trick or treating before, I'm not quite sure she really knew what was going on! Last year, shortly after turning 2, all she knew was that she was cold, wet, and wanted to eat all of her candy at once! 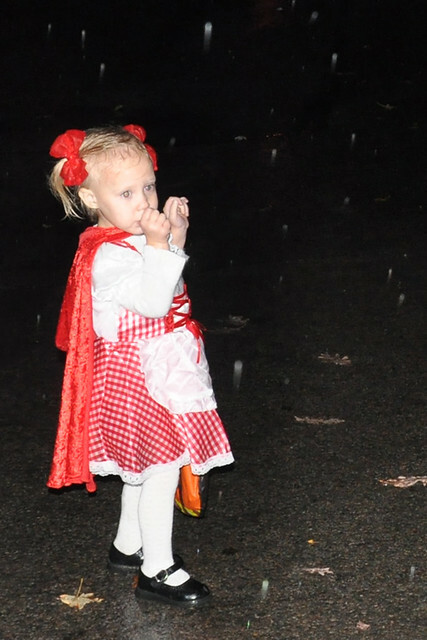 This year will be the first year she is really able to understand and enjoy Trick or Treating! I decided to let an episode of Jake and the Never Land Pirates help get her excited about Trick or Treating! Season 2 Episode 15 is called Tricks, Treats and Treasure! 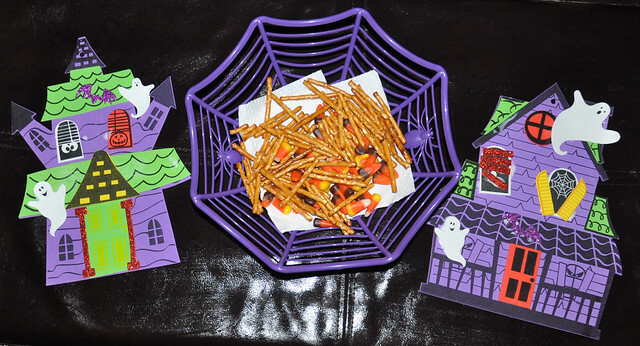 I created a fun evening for my girls, which included a snack and a craft. The boys opted for a scarier movie in another room, which worked out well, because us girls got to spend time together! Of course, no episode viewing would be complete without a special snack! 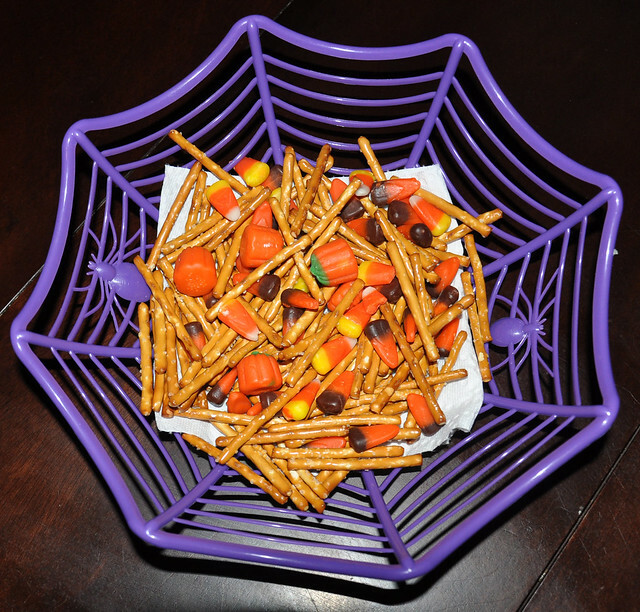 I called it my extra special Halloween Trail Mix, but really, it was just a blend of pretzel sticks and Autumn Mix candy. So simple, so easy, and thoroughly enjoyed! 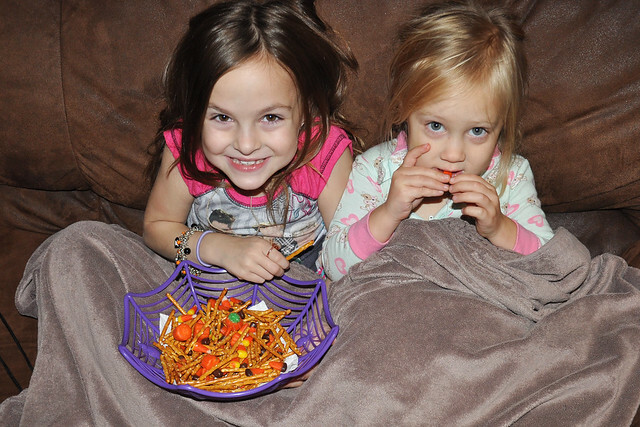 We curled up on the couch with our snack, and watched Jake and his friends Trick or Treasure. Captain Hook was there, too! When it was over, Lily clapped her hands and declared, "I wanna do dat!" 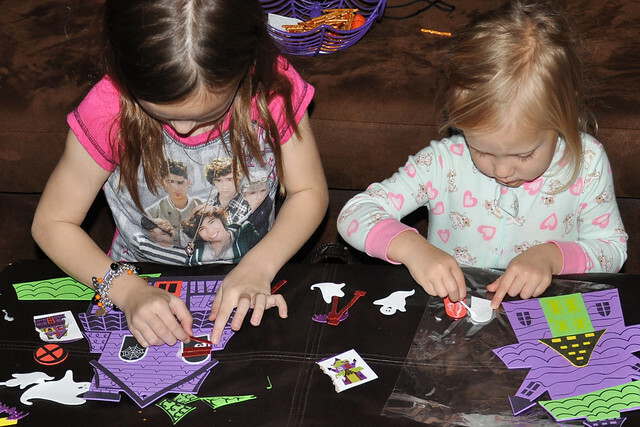 We talked a bit about Halloween and Trick or Treating as we worked on a simple craft. I'm a huge fan of foam craft kits. They are perfect for a 3 year old to work on with minimal help! The finished product is also a great decoration and keepsake! 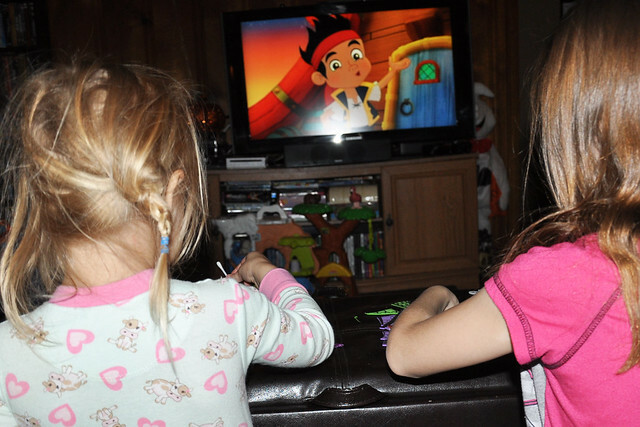 Lily and Lexie must have really enjoyed the episode, because they decided to watch it again while they crafted! We had a great time together! I was so thankful for a fun, memorable evening with my sweet girls. It really helped build the excitement for Halloween night! Lily is so excited about going Trick or Treating. I can't wait to see how much fun she has on Friday night! There are so many mini milestones that pop up in family life! Celebrate a few of them with Netflix! That snack looks so good!! My husband and I may have finished it after the kids went to bed! Looks like the girls enjoyed their evening. We actually have gotten rid of cable and we are dedicated subscribers to Hulu and Netflix. We are always looking for a new series to watch. I will stay tuned. Thanks for sharing. Good for you! I wish we could get rid of cable. It's so expensive and we rarely watch anything but Netflix! We totally got rid of everything but Netflix and love it!! Parenthood is one show on my list that Eric and I need to start watching asap! You should! It's really good! Love your postings. I look several times a week to be sure not to miss a day! I also am so addicted to Parenthood. Traveling their road of life up and down through laughter and tears. I am so sad it's ending this year. I turned off the expensive cable ($195) and went to Direct TV over a year ago getting the cheapest package ($39). I Love it especially the DVR that can record 5 shows at once. But I also use Netflix. I love the pictures of your children. They seem to grow so fast! (((Hugs))) to you and your family. Thank you so much, Darlene! That's a smart idea. We should do the same thing!